Top piece: 4 1/8 by 2.5 inches of Pixie Sticks (Striped & dotted) double-sided patterned paper. Stamp Witch in black ink & emboss with clear embossing powder. Cut circle for witch from Pixie Sticks (large dots) or Wicked Whimsy (small dots) (3 7/8 inches in diameter.) You can cut the circle before or after stamping because the stamps are on EZ mount & they're registered. This means you can see exact placement through an acrylic block. for the trail of her broom. Step 4. Most of the sweet little images on this great green paper are embossed, so it's nice to use them as embellishments. Step 5. Layer the papers (adding the top piece first & then overlapping with the bottom green patterned piece. Stitch the sides. Step 6. Adhere the matted circle with the witch image onto the card. Stamp Happy Halloween on patterned paper (in black ink.) Emboss it with clear embossing powder. Cut each word into a random shape & adhere the two words to a bit of black cardstock. Cut the black cardstock to make a little mat behind the words. Step 5. Add the front decoration (which was made the same way as the cards above--just 1 inch shorter.) Stick it on with Oh so sticky tape. Step 6. Add the handle (I've used a piece of: Black Magic Spell cardstock. I like how the green in it picks up the patterned paper, & the black ties it in.) A little piece of Oh so sticky tape works well. Hope your stamping is stampalicious! Oh MEL- this totally ROCKS! I love the bag- who would have thought to color the image BLACK? Love it! Lovin this cute set Mel. It was so worth the wait. This is an amazingly creative project Mel. I love the Silhouette! Great thinking outside the box... er... bag? This is so enabling.. links right to the store. I went on a collecting spree for copics and went to check out but shipping was $17 to Canada. Ouch... I'm considering yet. Love the witch!! If my kids were younger... this would be purchased but I'm not sure I'd make halloween cards at this point in my life. I do love them though. The puppet stage rocks and so does the hag bag. You always give me a morning chuckle!! OOOoooOOO this is awesome!!!!!!! I am lovin it!! What a super adorable card set Mel!!! This is great! Thanks for the tutorial... I'll have to try it out. Oh my! The entire project is super-cute. 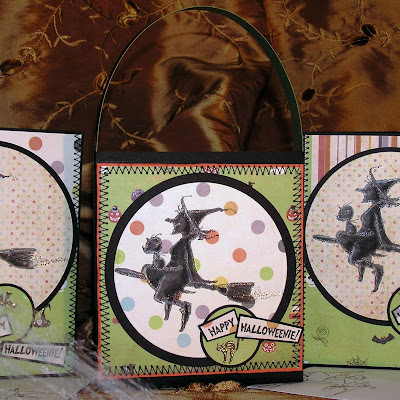 I really love that green paper and that witch stamp! OH Mel !! FANTASTIC !! 13 days of great stuff to start the day. Lucky us! How witchy lovely! Ha! You never disappoint, Mel. The projects are wonderful! This is AMAZING Mel!! I love it!! Awesome, awesome, awesome! Gonna have to go over these in some detail later! Alright, I held off until now to get this kit, but it is getting really close to adding to cart. Now all I need is to decide who to give these to. Super job and thanks for template for the bag. You are so patient to give us all the details of how you did each and every step. Awesome project! Mel, you are great! The stamp is adorable!!! Wow! These are awesome! You rock! Oh Mel, I just love what you've done! I could sit here all day and oogle what you've made! These are the coolest images! Really neat bag too! Oh, Anna, you can buy the kit and send it to me!!!! Soooo glad to help! Adorable-ness, cute-some, awesome-ly, and all kinda other made-up words!! Love your Hag Bag... especially the name! All your great ideas just keep flowing. Thanks for letting us see them all. Some spooktacular projects you've been doing for your new guest designer spot! Congrats! Oooh, such a fun Halloween bag! I love it! You make such cool stuff, Mel. I wish I had your energy! The set is such a fabulous Halloween gift to give out! Thank you for sharing your creativity. I'm wow'd everytime I stop by! Keep them comming. . .I'm having so fun looking at all your cool Halloween projects!! Mel, these are some great papers! Once again, I learned something new! It would never have occurred to me to color in the image all black to make a silhouette image! I love this! Good tip on cutting out what's going to be covered up too!